Whether the museums will continue with their spring events remains to be seen. A suicide attack in Brussels on Tuesday morning left at least 34 dead and up to 136 injured. Twin blasts hit the Zaventem Bruxelles International Airport and a nearby train at Maelbeek metro station near EU headquarters. Many fleeing the first bomb at the airport were caught on the train an hour later when the second bomb detonated. Luckily, a third bomb failed to detonate and was subsequently deactivated by the security services. Three bombers have been linked to the attacks, two of which are purported to have died in the attacks. The third bomber is still at large. ISIS has come forward as responsible for the bombings. Four days before the attacks, Salah Abdeslam, the main suspect in the jihadist attacks in Paris on 13 November 2015, had been apprehended in Brussels. The two bombers who died in the attacks have been identified as brothers Khalid and Brahim el-Bakraoui, Belgian nationals who were known to police. The bombings were a retaliation to the capture of Abdeslam. 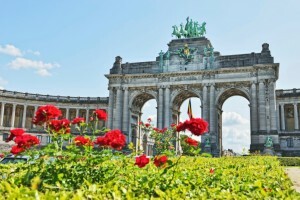 The attacks took place a month before Brussels spring art events, including Art Brussels, which opens on April 22, and Independent Brussels, which opens on April 20. Belgium has been preparing itself against terrorist attacks for months and was on the highest terrorist alert level after the capture of Abdeslam, according to Belgium’s Interior Minister Jan Jambon. Because the terrorist cell was able to respond so quickly while Belgium had its full defences up means that Belgium may become an easy target for terrorist attacks in the future. Because Belgium is a soft target, it still remains to be seen if it will continue with its planned art fairs and museum events. Brussels has been devastated by this violent attack against innocent citizens. President Barack Obama has stated that the bombings were “outrageous attacks against innocent people”, and a joint statement from the 28 EU leaders stated that the bombings were an “attack on our open democratic society”. As Brussels recovers from the attacks, the world has responded in support. Last night, Paris lit up the Eiffel Tower in the colors of the Belgium flag. Citizens within Brussels have also responded to the attacks by creating a mosaic of chalk tributes on the floor of the Brussels Stock Exchange. Citizens have also created an alter of flowers and candles in tribute to the victims of the attacks. With the world standing behind them, Brussels will stand strong and hopefully remain safe from terrorist attacks in the future. This entry was posted on Friday, March 25th, 2016	at 3:22 pm	and is filed under Art News	. Both comments and pings are currently closed.